This entry was posted in how to, textiles and tagged First World War, Mametz Wood, Peace Poppy, Sawdust Hearts, the Somme, Untangled Threads, WW1. Bookmark the permalink. Hi there – I have just happened upon your lovely blog through Nana Cathy and was reading about the beautiful heart you made. When I read about who it was in remembrance of it is so like my story and I wonder if they fought in the same battle. 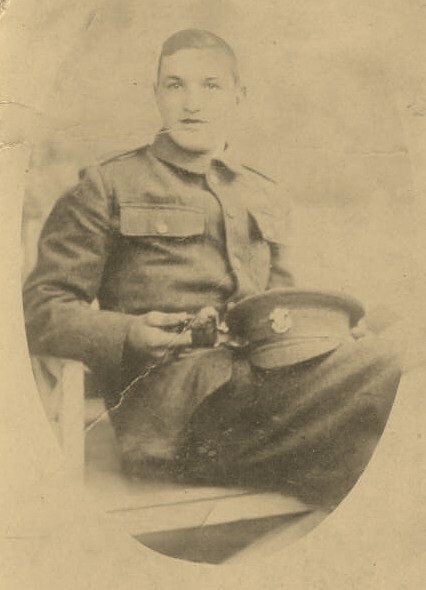 My great Uncle William joined up as a volunteer and was in the West Yorkshire regiment (the Prince of Wales own). Sadly he was killed on the 10th day of the battle of the Somme, July 10th 1916 – only twelve days after his 20th birthday. My granddad always kept a picture of William in full uniform on the wall above the fireplace – pride of place – and he would fix a fresh poppy to the frame every November like a sprig of holly at Christmas. I wear my poppy in remembrance of William and on behalf of his mother Flo (my great gran) and his brother Ernest (my granddad) who are no longer here to put a poppy on his picture. My mum was given a necklace made by William for his mum (my mum’s grandma) in the trenches from rolled up Woodbine cigarette packets, sadly I am not sure any letters from him still exist. Thank you so much for sharing you story – they died on the same day – and most probably in the same battle – gosh. How extraordinary to link them now 100 years later. Yes, I wonder what their stories would be if they could tell them. This is so touching. Your Uncle has not died in vain. This heart will also help others/me included to remember. I do my best honor all of the soldiers we have lost that I see or hear about. Thoughts and prayers thanking God for their precious lives.I shared this post with my youngest teens. And tears came to my eyes as I first read this. Such a sweet kind caring life cut short. (((HUG))) Thank You for sharing his story. Gosh such a tragedy. You have created a lovely memorial to him. It is such a wonderful idea, and I imagine seeing all those hearts sewn in memory would be incredibly moving. It was a bit overwhelming! What a human tragedy. 17. Such loss. Thank you for sharing this . Thank you Dorris. Yesterday was emotional. It always is when the 11th falls on a Sunday – but when it is also 100 years etc ……. I wonder if your sister-in-law has had similar experiences over the years. The Last Post always gets me going! This is a beautiful memorial to the young men who fought and died. War is such an ugly thing, and these hearts remind us of the individuals, and of their stories. So much potential lost, it is heartbreaking. Thank you Kathy. It is hard to comprehend the scale of it – and then to think it happened all over again. I’m with you there Eliza. I feel so grateful to have lived in a time when my sons were not called to war. Your heart is beautiful and the letter seems so poignant knowing your great uncle died so young. Thank you Karina. Tomorrow is going to be emotional! I remember my uncle, my mother’s younger brother, coming home after WWII. She was heartbroken because he was not the same. He became a hobo and an alcoholic. War is devastating. I sympathize with your heartache. My mother was born on Veteran’s Day, November 11, 1918. She was a quiet, loving woman. I miss her more the older I get, and I am 71 this year. My father was born without his left hand, and he was angry with draft dodgers in the 60’s. I bless ALL Allied veterans. I thank them for their service. I know it is hard for you, but what an awesome gesture. Oh, gosh! This brought tears to my eyes. What a lovely, poignant project. With this post, you have taken a war that seems far away and instead have made it vivid and personal. Seventeen is just a boy. Too young, too young. Thank you Laurie – I have to admit I will be glad when these 100 year anniversary events will come to an end – it is important to remember and to honour the sacrifices but oh how heavily they weigh on my heart. Oh, I can see why! Your heart really touched my heart. I can just imagine the pressure you felt to make a perfect heart, to honor a good man (boy, really!) who made such a sacrifice. Your heart is perfect, as is every other heart in the exhibition, I’m sure. Too much fighting, too much dying . . . when will we ever learn? I am in tears. What a beautiful heart, and a heart wrenching story. He looks so young, he was so young, far too young. Just a boy. I am so happy for you that you were able to do this, and with such a fitting and well thought out tribute to your Great Uncle John. He would be proud of you. I have watched the video on the home page of the project and shared it too. All a bit overwhelming isn’t it Deb. Thank you so much for sharing. It is strange that the only other person I know, as well as us, expressed the same anxiety about our efforts not being good enough. It felt like a responsibility to honour the people who died with something worthy of their lives. You have done a great job and your Great Uncle would be proud. The letter is incredible, bless them all. The number of the hearts represents the number of days of the war, and that number displayed in this way is very moving. I can’t imagine what it would be like for the number of hearts to represent the number of lives lost. Bring your tissues tomorrow, we will need them. Thank you Cathy, and thank you again for alerting me to the project. I wonder what my Great Uncle would think of his great nieces paying tribute to him 100 years later. My cousins are all doing something in his honour. I’ll stuff tissues in every pocket! I’m one who is deeply enraged by wars arranged by men in powerful places and carried out by the young and naive. I wish for a world where people no longer listen to the rhetoric and outright lies they are fed to inspire fear and hatred of other human beings and refuse to join the armed forces. They could go instead as aid workers to third world countries and other lands that are different in culture and religion and work there awhile, helping the locals and getting to know the unknown. Then such things as your beautiful hearts truly would honour those who were sacrificed in the war that ended all wars. It is more than heartbreaking to think of this young man of just 17 years, lost somewhere on a bloody battlefield and dying alone. A stolen life. You write so eloquently Pauline. Thank you. How can we as a species get rid of greed and the need to dominate and destroy – we really are doing our best to wipe ourselves out. Seventeen! He looks so heartbreakingly young in that photograph, especially if you picture him in civvies rather than in a uniform. What a wonderful commemoration of lost loved ones the sawdust hearts project is and the one you made is certainly more than ‘good enough’. Thank you Tialys. Heartbreaking is right!